The Minister of Petroleum and Natural Gas & Skill Development and Entrepreneurship Shri Dharmendra Pradhan launched the Dealer Owned Dealer Operated (DODO) model for setting up CNG stations. 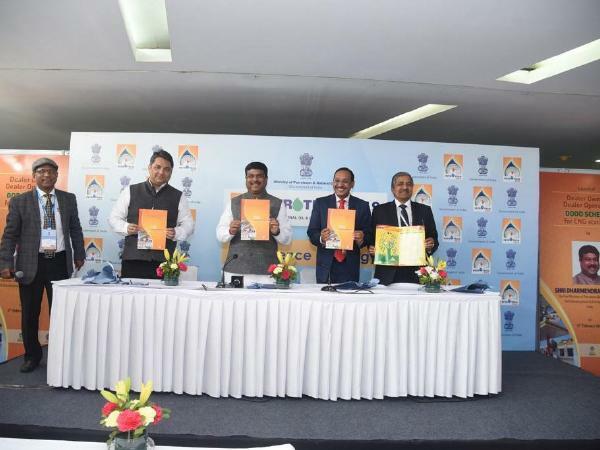 He released the general guidelines for the schemes, under which the entire earmarked dealer plot shall be developed exclusively for setting up of the station and allied commercial activities at the discretion of CGD (city gas distribution) activities. Under the scheme, 87 geographical areas serviced by 23 entities authorized will be covered. More than 1,500 CNG stations are presently operational in the country, catering to the demands of over 3.3 million NGVs. Under the 9th round of CGD bidding, more than 4,600 new CNG stations are expected across India in the next 8 years. The ongoing 10th round of CGD bidding is foreseen to cover 50 geographical areas, with 124 districts spread over 14 states, accounting for 24% of India’s area and 18% of its population. After 10th bidding round, 53% of the country’s area and 70% of its population will have access to CGD networks. As more and more CNG stations come up, more than 10% CNG stations may be based on DODO model. Shri Pradhan said that the country is moving towards the gas economy, as this fuel is cheaper and less polluting. The Petroleum Natural Gas Regulatory Board has undertaken unprecedented expansion of CGD network, and this will lead to laying of more gas pipelines, increased production and availability of the gas, and also last mile connectivity of the infrastructure to provide CNG and PNG to the consumers. He called upon the investors and private players to participate in the growth of gas based economy by using the opportunity provided through DODO.